As we embark and many site plans this spring it is showing up again... we come to a home with an existing feature in need of some TLC but even if it were working perfectly it still doesn't serve it's primary purpose -- Visual and Auditory Pleasure for the Homeowner-- It is facing away from the home or deck. Many yards have a natural hill. The temptation many DIY pond builders and unfortunately even some professionals is to place the waterfall on this incline. Here's the thing, usually this hill is facing away from the viewing areas. So who are you building the waterfall for? The squirrels? I am sure they appreciate it but wouldn't you like to enjoy at least as much as the wildlife in your yard does? This is part of why our projects are special. We take the time to visualize where the client is going to be daily, how they are going to live with the water feature. We take the time to analyze the best viewing areas both inside and outside the home and if the site doesn't have the correct topography we create it. We will often build up a berm that naturally fits the yard so you don't end up with the unfortunate landscaper turn pond guy for a weekend "volcano" shape (if you spend any time on Pinterest you have seen these...). 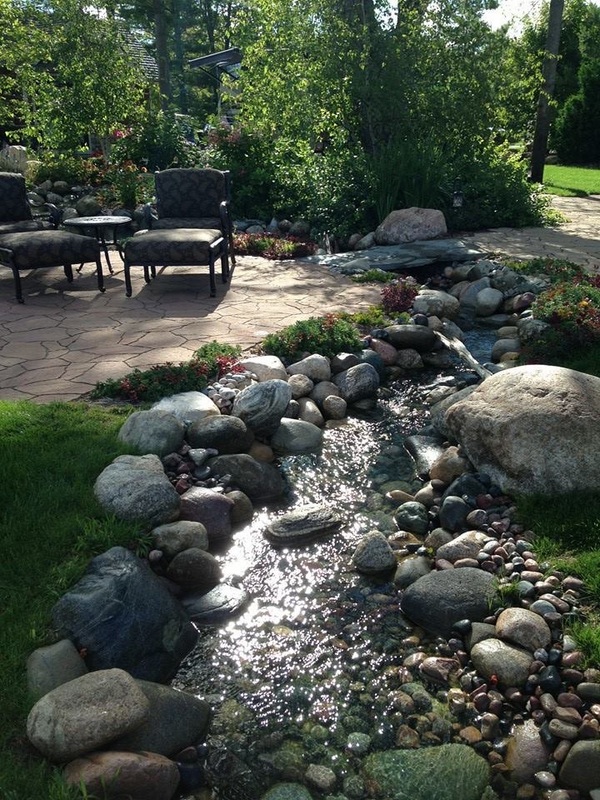 Your water feature should look like it was put there by nature itself. As if a spring was sitting in your yard and this pond and waterfall happened over time. In Northern Michigan we love our homes for they way in which they interact with nature. Why mess that up with a poorly placed pond or waterfall? When you are ready to have a water-feature that accentuates your home and life give us a call and let's talk! This stream system was built around the patio areas of this yard. From every seat there is a view and the yard is alive with the sound of a meandering stream.